The 3rd edition of World Communication Forum “Communication on Top” held on 9-10 February, 2012, brought much more than the normally expected geographical or cultural diversity of any diplomatic conversation typical of a global summit: uniting 100 practitioners from 28 countries around the world, it penetrated beyond the scheduled agenda, going past artificial solemnity, provoking heated discussions and amazing networking activity and delivering a sense of unique experience, with memories that warm the hearts of all its attendees! The key impression was well voiced by two remarkable communication experts who took part in the summit and contributed largely to its tremendous effect. “WCF’12 was so diverse, that you could actually see people get inspired by that! It is precisely what you should take from Davos – inspiration from a different field which helps you to reflect on your own work and make improvements!" In just 3 years the forum has registered over 60 partners and 240 participants (190 unique) from 35 countries, representing a total of 61 agencies (8 global ones), 43 companies in various business sectors (aviation, energy, banking, engineering, manufacture, technology, etc. ), 12 large international associations, 8 media units, 7 universities, and 5 government bodies. WCF 2012 united communication representatives of Europe, North and Latin America, the Middle and the Far East, who shared valuable industry expertise and its successful application strategies in different areas: business, science, technology, media, consultancy services, online interaction, functions of large public organizations, etc. “The communication business thrives on free expression and the last thing we would want is governmental restrictions on this freedom; the key is education – we teach our children road safety and that's exactly what we need to do with internet.” (Daniel Holtgen). The second debate that served to pin-point key strategies in modern corporate communications was “Who should run internal communications – HR, PR, CEO or every employee?”, provoking a discussion on the (in-)appropriateness of control and the need for integration of employee relations with all other types of communication. Paul Holmes, the PR industry guru, shared: "The world would be a much better place if PR people had more responsibility in general. HR are good at talent-hunting, IR – at securing investors, Marketing – at attracting customers, yet companies should start dealing with people in the whole – recognizing them not just as mere employees, but as customers, shareholders, members of the community. Sharing information is about giving up control: modern communication is about letting others (bloggers, journalists, housewives, employees, etc.) tell your story in their own way. The trend towards greater institutional transparency allows our better-informed consent when it comes to purchasing decisions, and higher transparency guarantees better governance." - Communication of science and innovations: promoting what isn’t there yet, keeping the balance among transparency, ethics and authorship, differentiations between talent-hunting and head-stealing, successful marketing strategies and the eco-aspect of modern science parks. Useful advice found applicable to the communication industry in this area was: “be open & comprehensible”, “make people smile & laugh”, “use plain language”, “gain credibility – be honest”, “have fun”, “focus on examples”, “find a common language for scientists & entrepreneurs”. - Latest trends in communications consultancies: the challenge of being relevant, localization vs. globalism in contemporary consultancies, key strategies for maintaining successful relationships with clients, partners, and stakeholders. Gianni Catalfamo, social media expert and European Digital Director of Ketchum Pleon stated: "What's behind PR? P stands for Public, yet for me R is Relevance. Staying relevant is the challenge we face today, especially in our digital world – the vast number of options tempts people to tune out of our messages, and the only way to win the battle is by staying relevant. A shift from Relations to Relevance is the major trend in modern communications." - The modern mission of communication associations: Forming a professional community or engaging socially? The answer was “do it professionally, while taking into account what needs to be done socially in the specific region”, provided by representatives of some of the largest industry organizations: the European Association of Communication Directors (EACD), the Russian PR Association (RPRA), the Mexican Society of Public Relations Professionals (PRORP), and the Association of Business Communicators of India (ABCI). - Place branding and Territorial reputation management: the synergy between national reputation and successful local brands, between the image of a country and its popular cultural aspects… One of the conclusions was that the “best corrective of stereotypes is personal experience: you may have one idea of a place, yet when you get there, it may turn out something else”. Investor relations communication strategies: attracting start-up capital and factors that shape up investment decisions, communicating financial prognosis and developing new media platforms. - Marketing communications: online interactions, the viral effect of internet, how to provoke the user’s creativity, contagious ideas and the secret to their virality, the contemporary synergy between marketing and emotions, and the challenge of virtual as opposed to real. After his first best-seller, Mirko Pallera, founder and CEO of Ninja Marketing, presented to the forum audience the formula for a “Viral-DNA of an idea”: the genetic structure behind successful global brands and their tremendous online popularity via the social media. His presentation accentuated on “spiritual marketing as the future of branding; meaning as the new value proposition of marketing; viral as the social sharing of emotions; archetypal branding as an act of soul-making.”Another marketer, blogger and best-selling author – Rohit Bhargava, SVP Global Strategy & Planning at Ogilvy and Adjunct Professor of Global Marketing at Georgetown University, spoke on the rise of content curation, its impact on marketing and PR, and successful solutions to modern believability crisis. The following tendencies were outlined: companies start to find their humanity; everyday images unlock digital content; real life inspires products & tools. 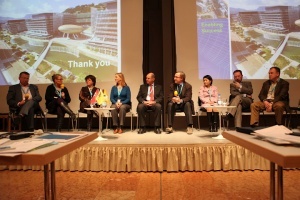 Welcome to the Fourth Edition of WCF-Davos on 7-8 February, 2013!